MUFF WIGGLER :: View topic - TR-606 Restoration - No Pattern Write Mode? TR-606 Restoration - No Pattern Write Mode? I've got ahold of a TR-606 and I've opened it up and given it a good and thoughtful cleaning and inspected it. Inspected the board for corrosion, broken jumpers, bad wires, cut traces. Everything looks pretty nice actually. 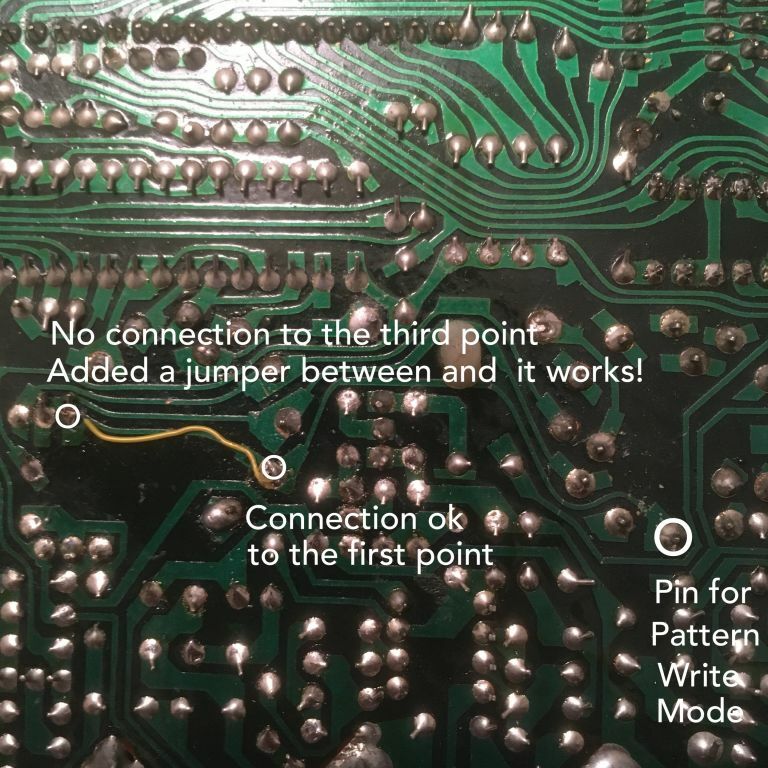 Read up about other people's troubles with the 606 and double checked the device for cold solder joints, continuity between all points on the Mode potentiometer, all jumper wires, the DIN Sync Jack etc. Everything appears to check out. At this point, since it doesn't appear to be the CPU or the RAM, I'm guessing it's going to be the TC4011 or other such logic, but I'm not exactly sure why this might prevent the entire Pattern Write Mode from working or coming on line when selected. Has anyone encountered a complete omission of write mode on a TR-606 repair or restore? I'm open to any ideas to follow up on. both pattern and track write do not work? how does it respond when you put it into write mode? does it act like play mode? or do the buttons respond as if it were write mode, but nothing gets written? or is it just completely unresponsive? The device acts as if the mode hasn't been selected. So play and write modes are identical. Next thing to try is to replace the IC's - Get a new NAND gate and Hex Trigger IC in there and see if that doesn't help, but I think the thing I am suspecting that I don't know is why wouldn't the mode at least be accessible? It's as if the mode is just gone. Again, I have tested the pins of the selector potentiometer (SRM 1034) for continuity, and I get a beep at the next (and then the next) pin for the whole thing. I had a 4011, 4013, and 4001 on hand, so I removed them from the pcb and socketed them, and replaced them with fresh, new IC's. Still no pattern write mode. No change in behavior. I'm going to proceed and replace all the IC's (I got my eye on that AN6912) and we'll see... but I can't really figure out why any of this would prevent an entire mode from being entered into. This is the neural pathway I need to create for myself here. I'm open to following any leads, or if anyone else has encountered this, or something like it, I'd love to hear your story. are the powersupply rails present on all ics? the memory chips are fed from the batteries, and if a diode is gone in the powersupply, that wont switch over from the wallwart supply. is anything else wonky in pattern or track play mode? do those work 100% as should? do you have an oscilloscope? the next thing i would check is if the switches are getting scanned and read correctly. but, this is hard to do without a an oscilloscope as the lines are pulled high for a very short period of time. Will investigate all of this carefully and reply with results. I connected the battery wires to the bottom case, and installed fresh batteries. The behavior is the same. No change. I'll move on and look at the diodes, and try my best to follow the leads out from the switch and repost back more. well, if you dont have an oscilloscope, you can shut the machine off, and use your multimeter to make sure the switch is making good contact through all of its positions. can you select the various drum sounds individually? does that rotaray switch work? in particular, can you select the bass drum? you can also go through with your multimeter set to diode check mode, and check all the diodes. do them in both directions. I tested all of the diodes and got some surprising results. Most of the diodes are IS2473 (cute, tiny little things) and they measure either 0.59v - OL or the other way around OL - 0.59v which seems normal to me. D43 is a different type of diode and it reads 0.357v - OL and that seemed normal to me too. Is this possibly 9 bad diodes? Dang. Well it's fixed! I can hardly believe it, but it actually works!!! After that diode test I started wondering if I couldn't just start swapping the weird ones with 1N4148's. To avoid the heartache of either madly ordering more components in the middle of the night and waiting a couple weeks for them to arrive, OR further wear and tear to discover that no, the 1N4148 is not an acceptable replacement for the 1S2473, I moved on to the next test. The Mode Selector switch only had 4 positions. Many of the pins go to little islands. The pin beeped for continuity at point 2, but it did not at point three. So I added a little jumper between points 2 and 3 and plugged it in and like an exhilarating force of nature the TR-606 has Pattern Write Mode again!!! And most importantly the instrument select and step input functions. I'm so grateful to you for your help. Thank you. Now to order a set of switches. I only have 2 spare here, and it seems like I'm going to need 10 of them. May as well order a set of 21 and replace them all. im glad to hear you found it. lifted/cracked traces are pretty common on those old boards. my 303 had a similar issue. I think this is what's wrong with my 606; it mostly works, but if you flex the case a little bit then it goes berserk. I figure the PCB is a bit "rotten" so I've been waiting for Paul Barker to decide to finish his RE-606 PCB(s), but then I'll have to transplant each part to the new PCB. I can't decide whether this would be more or less tediously unpleasant than trying to track down the cracked traces in the original PCB, particularly when you have to keep bending the board to get it to fail. Can I ask you guest what your advice would be? How did you isolate the location of the problem(s) with your 303 PCB? Cheers! Happy that Sunshine Jones got it running smoothly - bad RAM, switches, and traces are definitely most common for functionality issues with the 303 & 606 from the dozen or so I've worked on. Synchromesh - Which part of your 606 goes berserk? With harline fractures, my advice is to isolate the issue to the area that's misbehaving and go through it trace by trace. One thing that helps a lot is either loading the schematic into graphics software and highlighting traces and checking them joint to joint, or doing the same with a print out. On the computer it's easier to color code the power and different signal paths. Working this way will also help you isolate if the issue is on a specific component instead of the traces. Something may look fine, but be damaged internally. The catch 22 with swapping everything to a repro board is that you could end up with "restored" 606 with the same issues. Can I ask you guest what your advice would be? How did you isolate the location of the problem(s) with your 303 PCB? Yeah, visual inspection of this one didn't reveal any obvious trace issues, nor visually observable problems. To be fair, it was seriously toast and headed for the bin when I intervened and began to look into restoring it. The best direction I received here (anywhere) was to be patient, and go over the traces and points until faults are found. The tricky part for you and your machine is that it doesn't do it unless you stress the board. Please don't demonstrate that too much. Have you followed the schematic and the traces with a multimeter for continuity on the bottom of the pcb? That's how I found this problem and was able to jump it no sweat. I'm absolutely going to undertake the RE-606 (and the RE-808) when they're ready, but there's something about restoring and repairing the original that has a lot of value for me. Worth a cursory once over for sure. The catch 22 with swapping everything to a repro board is that you could end up with "restored" 606 with the same issues. I have no screws for this unit. It was (as I said) headed for the dumpster when I intervened and paid the guy off to let me at least try to save it. your local hardware store might have them. they have a really course thread, no point, and a pan head. 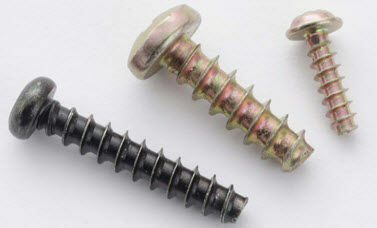 an english #4 screw should be close enough to work as well. id echo meatcliff here. i had the same issue, where it only failed on bending, or sitting at a certain angle. basically, the output would cut out, so i narrowed it down to the VCA/headphone section. i then visually inspected, but didnt see anything as it was a hairline fracture in the ground plane. so i went through with a multimeter while flexing the board. one other thing you can try, i just reflowing all of the solder joints in the affected area, maybe applying a bit of flux. sometimes its a pad that has lifted, but you cant see that because the break is right where the solder ends, so there is a visual line there already. is it just board flexure that causes it to fail, or do certain pots/switches/jacks cause it? there are multiple boards inside, so you can flex them individually if you open it up. you can also press locally on sections of the pcb and see if that makes a difference. the stuff that you touch (pots/switches/jacks) is where the most stress is, so around these areas is the highest probability of failure. Yes, sorry Sunshine Jones, it was rude of me to ignore the OP... Congrats on tracking down the problem, I admire your perseverance. It's great that you've saved this 606 from oblivion! And thanks to meatcliff, Sunshine Jones and guest for your advice and suggestions. I have recorded some video to demonstrate the issues (at 4:42 I press RUN/STOP FWIW). I don't think the issue is with the rotary switches particularly. Once I stop the unit playing I still get some triggered notes out of it, so perhaps the problem is on the switch board. The switches, pots and LEDs were replaced after I bought the unit; as I recall everything was more or less OK, but pretty soon it was acting up pretty severely. I have had a look at the PCBs but I clearly didn't approach it in a sufficiently diligent and systematic manner. I do have a nice copy of the service notes so I could copy the schematic & PCB layouts and start working my way through. If anyone can sit through my video and offer any more comments/advice, that would be most appreciated. there used to be replacement switch pcbs you could buy, but i dont think they are available anymore. that would be a pretty quick way of testing it out. id reccomend opening the 606 up, and spreading the pcbs out a bit. then set it running in pattern play mode, and apply pressure to the various boards individually. maybe you can narrow it down to a single board that way. you can also try pulling on the cables between boards. its looking like something on the switchboard. Thanks guest, I'll try that first. Weird behavior... I'd check very carefully at the ribbon connectors and wires going between the switch board and the main board for frayed strands that might be shorting.